I have two 290 watt panels in series that are currently used to charge a 48V battery bank via a MPPT charge controller. The run from the panels to the charge controller and batteries is about 70', and I've got a PV-direct load (one or more DC fans) I'd like to run that is 30' in the opposite direction. I know the output voltage from the panels will vary widely, but assuming the PV-direct load (i.e. fan(s)) is able to handle that range is it possible for me to tie in to the existing +/- outputs from the panels (combined, something like 75V max) and run that over directly to a DC load (in addition to the run to the charge controller)? My primary concern/question is how this might affect the charge controller (a Victron SmartSolar MPPT 150/35). I think the draw from the fan(s) would be quite low in proportion to the "power" of the panels, so would it just be that the charge controller would only "see" / experience a reduced voltage level coming in from the panels (e.g. what might otherwise be a strong 75V might only come through as 60V due to PV-direct load burning-down some of that potential energy)? Is this kind of setup "allowable" / advisable? i.e. having a PV-direct load in addition to a MPPT charge controller "load", each on separate circuits. Would the PV-direct load side need its own ground connection? BTW, I know the PV-direct load circuit probably can't be as simple as depicted below; for example at the least there would probably be a voltage monitoring relay ensuring the fan can only kick in above some set voltage and also a thermostat. 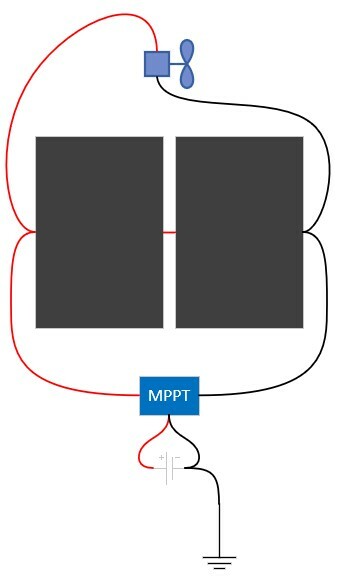 The effect of this is that those loads will draw there power without MPPT regulation, which, depending on how large those loads are, could decrease the efficiency of the existing MPPT. In any case you would likely need some sort of voltage regulator for the load and it would no longer benefit from the UPS capabilities of the battery bank. You need to know how MPPT works. It is a method of optimizing total power output of your solar panels by controlling the load you expose them to. Because of the I^2R losses of a panel, it is best to draw only so much current as to optimize the P=IE total power output. A MPPT controller regulates its input to optimize this and regulates that power to pulses of battery charging voltage. It may or may not include an inverter or other regulated output circuit to actually draw from the battery bank. The MPPT will optimize the results of the leftover voltage from your fans, but the fans may push the current into a less favorable range than could otherwise be obtained. Is this kind of setup "allowable" / advisable? I will permit it, but you should evaluate for yourself if there might be a better way. Would the PV-direct load side need its own ground connection? If you are asking, you need to learn about grounding and bonding, as it is crucial for safety and you're operating at not trivial voltages and currents. Be sure to learn the difference between a ground, and a neutral/identified conductor. Depending on what you mean, you likely should have a ground reference for each voltage in the circuit. BTW, I know the PV-direct load circuit probably can't be as simple as depicted below; for example at the least there would probably be a voltage monitoring relay ensuring the fan can only kick in above some set voltage and also a thermostat. Not the answer you're looking for? Browse other questions tagged dc dc-motor solar-energy solar-charge-controller or ask your own question. Is it possible to power a solar MPPT charge controller from a backup DC power supply? Can I use a 12V battery charge controller to “ballance” two batteries? Does a Buck-Boost Converter/PWM controller significantly reduce the energy you can get from solar panels? How does a maximum power point charge controller regulate the charging current, when it always draws the maximum current from the panel?